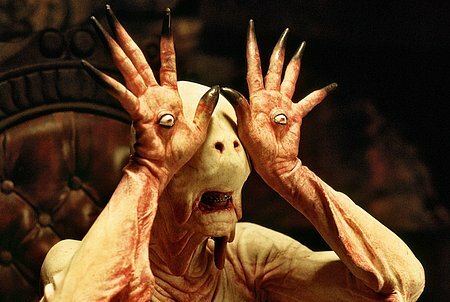 Guillermo Del Toro’s ‘Pan’s Labyrinth’ To Become A Stage Play!!! I really don’t understand why, but hell, this would be one awesome stage production with all the costumes and sets. Guillermo Del Toro‘s ‘Pan’s Labyrinth‘ is being developed into a stage musical. Don’t fret though, del Toro and Jeremy Ungar have written the stage version already with Paul Williams writing the lyrics to the songs. Gustave Santaolalla, an Oscar winner is composing the score. How cool is this. Del Toro has been working on this for years in secret according to Deadline, and has also been interviewing directors and composers for the stage version. “I admire and love Gustavo and Paul wrote the perfect album in ‘Phantom Of The Paradise‘, which I have loved for decades,” said del Toro, who just wrapped ‘Pacific Rim‘ for Legendary Pictures and Warner Bros and who’ll next direct the haunted house tale ‘Crimson Peak‘ for Legendary. “I’m so excited about translating Guillermo’s magical vision into music and songs. I’m such a longtime fan of both Guillermo and Paul that to work on this with them is truly a dream come true”, Santaolalla said. Let it also be known that Guillermo, Williams, and Santaolalla are also all working on songs for the animated Reel FX film, ‘Day of the Dead‘. Guillermo is quite the busy man these days. He is one of my favorite directors working right now. George A. Romero ‘Between Night And Dawn’ Collector’s Movie Set Coming In October!!! NBC Picks ‘Hairspray’ For Next Live Musical!!! This entry was posted on Thursday, December 6th, 2012 at 4:49 pm	and is filed under Film, News. You can follow any responses to this entry through the RSS 2.0 feed. You can skip to the end and leave a response. Pinging is currently not allowed. « Dennis Haysbert Will Replace Michael Clarke Duncan in ‘Sin City 2’!!! Uh uh uh... I didn't hear you wash your hands.